With more styles, colors and materials to choose from than ever before, mosaic tile patterns are making a comeback for bathroom floors. From retro designs to contemporary styles, mosaics can complement any look. 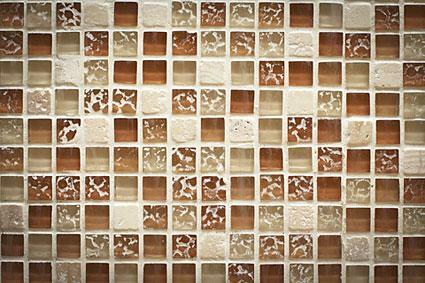 A mosaic tile is defined as any shape material that measures 2-inches or smaller in size. Mosaic tiles can be made of stone, glass, porcelain, metal or ceramic and come in a wide range of colors, shapes and styles. Since small tiles can be time consuming and difficult to install, most mosaic tiles will come mounted on a sheet. Depending on the type of material, this sheeting may be a mesh on the back of the tiles, or paper covering the front of the tiles, which is removed once the tiles have been installed. Mosaic floor tiles rose to popularity during the Victorian era. When bathrooms and plumbing were making their way indoors, they were frequently housed in what was once a closet or other small space. Since the substrates of these areas were typically not strong enough or flat enough to handle larger materials for bathroom floors without damage, mosaic tiles became the answer. Mosaic tiles have the ability to flex at each one of their grout joints, allowing them to conform to a sloping or hilly floor. When the substrate flexes underfoot, the tiles flex with them, making them the perfect solution for old bathrooms, shower floors and unstable substrates. Patterns developed during the Victorian time period are still in use today. Basketweaves, hexagons and octagon-and-dot patterns are still used and created for many bathrooms. During the period from the 20s to the 60s, mosaic tiles took on new designs. Flower patterns of black and white in hexagons, target or spiral patterns and "dog-bone" basketweaves came into play. Most patterns used during this time period were two-tone, with the wall tiles complementing them. Mosaic tiles are more popular today than ever before. Whether you are designing a retro bathroom, or a contemporary one, there is a mosaic pattern out there for you. Penny tiles, or circle tiles are a new twist on an old design. Small, thin circular tiles in glass, ceramic or stone add a whimsical twist to any bathroom floor. Use them in kids' bathrooms in a rainbow of colors for fun design. Handmade tiles produced by Pratt and Larson of Portland, Oregon are amongst the forerunners of today's mosaic tile patterns. Hand designed starbursts combine with squares and rectangles for truly unique mosaic patterns. Select a different color for each shape for a contemporary design that pops. A fan or fish scale pattern consists of tiny mosaic tiles, 5/8-inch in size mounted onto a sheet in the shape of an arched fan. The sheets are laid next to one another in an overlapping pattern that appears like water jetting up from a fountain. Let these mosaics draw your eye into a room, and use them in exotic stone colors, such as Blue Celeste or Honey Onyx for extra detail. 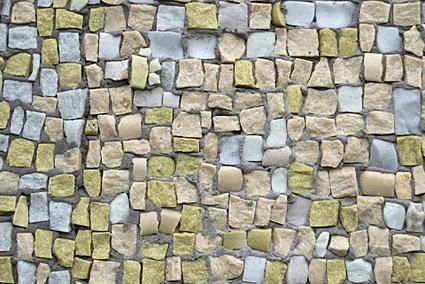 River stone and glass river rock mosaics are perfect for lending a Zen garden feel to your bathroom. As you walk over these gently rounded tiles, they provide a massage to the feet and a feast for the eyes. Random mosaic stones are the cousin to river rocks. Stones plucked from nature are ground down to a flat surface, but maintain their original natural outline. Mounted on sheets and interlocked with one another, these random mosaics add quiet tranquility to any space. Mosaic tile rugs, medallions and custom patterns are all available from companies such as New Ravenna and [www.mosaiquesurface.com/ Mosaique Surface]. Whether you want a leopard skin pattern for your powder room floor or a delicate pattern of vines and flowers for your master bathroom, a custom pattern can deliver. Select a pattern, and choose from hundreds of colors of polished or tumbled stone to create a design sized to fit your room exactly. Or work with an artisan to create something truly unique and inspired. Mosaic tile patterns are perfect for small spaces, where the many tiles emphasize pattern rather than the size of the space. Mosaics are also non-skid material, with their many grout lines grabbing the feet, making them a great choice for any bath. 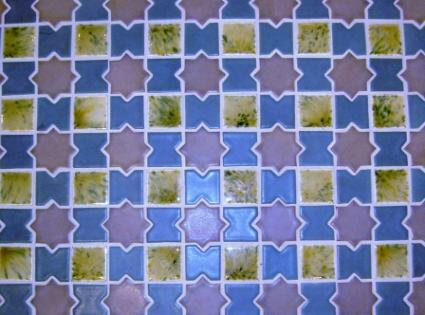 Consider using mosaics in your next bathroom floor design, and let color, style and pattern reign.